Where do we work as a team? Hockey comes to mind, as well as school plays, snow creations in the yard, and pirate crews. All of these are featured in these picture books for the K-3 audience. And what about the running of a local shop? 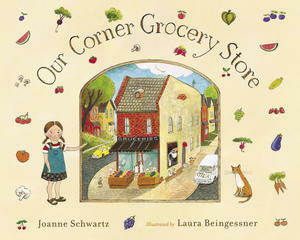 Our Corner Grocery Store, by Joanne Schwartz, illustrated by Laura Beingessner, is a sweet portrait of a day in the life of a neighbourhood store, the kind that slices meat one sandwich at a time. This first person narrative of a little girl helping her Nona and Nono captures the seamless teamwork required to run a business. Beingessner's lovely detailed pictures show life in the house above the shop as well as the surrounding neighbourhood. 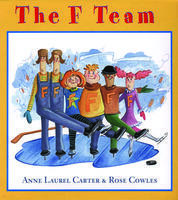 The F Team, by Anne Laurel Carter, illustrated by Rose Cowles, features a hockey team that just can't seem to beat the A Team, who are all about winning. So they take a different tack—distracting the other side with figure skating moves, turning “failure” into “fearless.” This is a true collaborative effort, featuring Fred accidentally dropping his pants on the break-away winning goal. 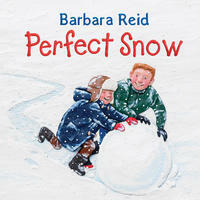 In Perfect Snow, by Barbara Reid, Scott and Jim wake to just the right kind of snow for building. At recess, the kids swarm the snow "like ants on a dropped ice cream cone." There's the usual stealing of snow boulders for forts around the yard, the typical resulting brawl, the threat of deconstruction at the sound of the bell. Jim and Scott turn things around by inviting everyone to build a whole team of snowmen. The illustrations are part drawing, part plasticine. As in all snowmen stories, the weather wins in the end, but the boys see rain as a new kind of fun: slush! What is it to be part of a pirate team? 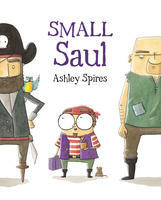 In Small Saul, by Melanie Watt, all the other buccaneers find Saul too little, too tidy, too kind and with too much interior design sense. Poor Saul fails at looting, fighting and rough talk, and is finally made to walk the plank. But the ship morale falls without Saul and he's finally seen as a valuable member of the pirate crew. Watt's characteristic sense of humour comes through in her illustrations. A school play is a true collaboration. 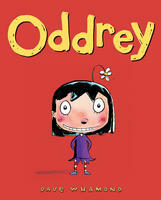 In Oddrey, by Dave Whamond, the main character has spent her whole young life trying to stand out, but her individuality has left her feeling lonely. When she gets cast as a tree in the school play, Oddrey discovers a different way of going against the grain. She helps those struggling with their lines, their props, their movements, their self-concept, and finds herself accepted as valuable member of the class. Whamond's whimsical illustrations are bold and compelling to a young audience. 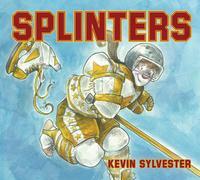 Splinters, by Kevin Sylvester, is the Cinderella story set in the hockey world. Cindy Winters is a talented skater who saves her pennies to enrol in a real hockey league. There, she encounters the wicked Blister Sisters, a fairy goaltender, and a shiny zamboni ready to transport her to special tryouts sponsored by Coach Charmaine Prince. Cindy's skate is left behind at the final buzzer, launching a hunt for the new team member. A fun twist on the traditional tale, and a way to talk about how not to behave on a team!